Cobourg Street Primitive Methodists' Chapel was located at the junction of Cobourg Street and York Street, immediately opposite the Albion Spirit Vaults Public House. and York Street, right, 1909. It was built in 1907 for the Primitive Methodists and opened in 1908 with seating for 700. On January 11th 1936 the Western Evening Herald newspaper reported that that the owners of this Chapel and 35 William Street had sold out to the Council for £13,050 plus fees to enable the widening of York Street to progress. 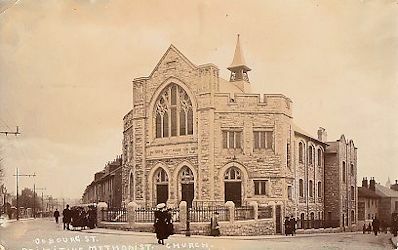 Money from the sale of the premises was used in 1938 towards the cost of the new Compton Methodist Chapel.